Alexa Grant’s stalker is determined that if he can’t have her, nobody can—even if it means killing her. And as she searches for a safe haven in Amish country, it’s Sergeant Gavin Jackson’s job to protect Alexa…or risk losing her to a deadly secret admirer. 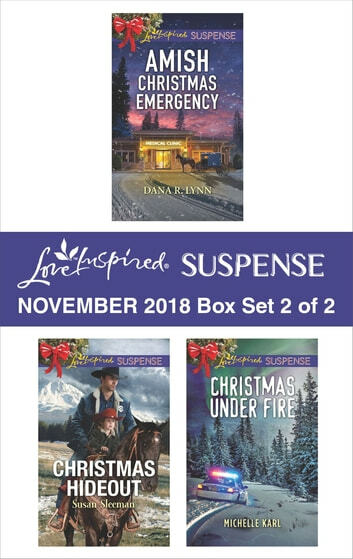 Fleeing from her dangerous ex-boyfriend, single mother Nicole Dyer takes refuge in a cabin on a ranch—and is discovered by the owner, Deputy Matt McKade. When threats escalate to attempts on Nicole’s life, Matt is the only one she trusts to keep her and her daughter safe. It’s Mountie Aaron Thrace’s duty to guard visiting dignitary Cally Roslin during her stay in Canada—but he never expects he’ll be facing down ruthless assailants determined that she won’t survive the holidays. With danger and a snowstorm closing in, can he make sure she lives to see Christmas?